Characterization of protein deposition in vitro. Chapter 1: Purification of Polyglutamine Proteins Chapter 2: Preparation of amyloid beta-protein for structural and functional studies. Chapter 3: Kinetics and thermodynamics of amyloid assembly using an HPLC-based sedimentation assay. Chapter 4: Protein aggregation starting from the native, globular stete. Chapter 5: Direct observation of amyloid growth monitored by total internal reflection fluorescence microscopy. Chapter 6: Characterization of Amyloid Structures at the Molecular Level by Solid State Nuclear Magnetic Resonance Spectroscopy. Chapter 7: Spin Labeling Analysis of Amyloids and other Protein Aggregates. Chapter 8: Hydrogen-Deuterium Exchange Mass Spectrometry of Protein Aggregates. The ability of polypeptides to form alternatively folded, polymeric structures such as amyloids and related aggregates is being increasingly recognized as a major new frontier in protein research. 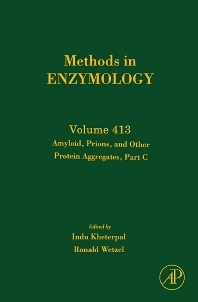 This new volume of Methods in Enzymology along with Part B (volume 412) on Amyloid, Prions and other Protein Aggregates continue in the tradition of the first volume (309) in containing detailed protocols and methodological insights, provided by leaders in the field, into the latest methods for investigating the structures, mechanisms of formation, and biological activities of this important class of protein assemblies.